By Megan Friedman || Every election season, it’s the same old tune: Liberal musicians get outraged that conservative politicians use their music at rallies. Dozens of artists have called out Donald Trump over the years, and this weekend, Rihanna even spoke out about it after Trump used “Don’t Stop the Music” at a Tennessee rally. Guns N’ Roses frontman Axl Rose also spoke out about Trump’s music choices this weekend in a Twitter rant that actually helped explain why this keeps happening. “Can [you] say ‘shitbags? !’” he tweeted, adding an appropriate poop emoji. He said he spoke up because people were telling him they heard “Sweet Child of Mine” playing at a rally. “As a band we felt we should clarify [our] position,” he wrote. 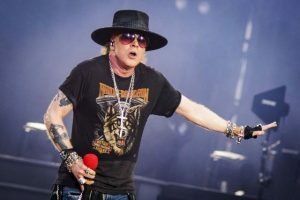 Later that day, Rose tweeted once more to clarify his political position—and noted that fans of any political persuasion can listen to Guns N’ Roses. But that’s not going to stop him from speaking out against Trump.